Monsters captivated the imagination of medieval men and women, just as they continue to fascinate us today. 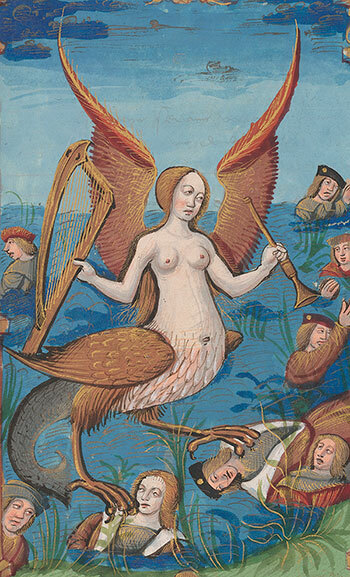 Drawing on the Morgan's superb collection of illuminated manuscripts, this major exhibition, the first of its kind in North America, will explore the complex social role of monsters in the Middle Ages. Medieval Monsters will lead visitors through three sections based on the ways monsters functioned in medieval societies. "Terrors" explores how monsters enhanced the aura of those in power, be they rulers, knights, or saints. A second section on "Aliens" demonstrates how marginalized groups in European societies—such as Jews, Muslims, women, the poor, and the disabled—were further alienated by being figured as monstrous. The final section, "Wonders", considers a group of strange beauties and frightful anomalies that populated the medieval world. Whether employed in ornamental, entertaining, or contemplative settings, these fantastic beings were meant to inspire a sense of marvel and awe in their viewers.